Well, the waterproofing experiment didn’t work. I may have done something wrong, or perhaps the sealer and the paper mache clay aren’t compatible for some reason. I’ll drag him inside with my hand truck and let him dry out (that didn’t occur to me when I was making the video), and when it’s completely dry I’ll try brushing on more sealer. To do a really good experiment, I could do half of the hat brim with the sealer I already have, and half of it with a sealer from Lowes, and see if one of them works. At this point, though, I’m not feeling very positive about it. The brim on the hat is flexible now, after the rain, although it isn’t at all like the paper mache clay was before it dries. You can’t sculpt with it, I mean, or put a thumb print into it. But still. At this point, I recommend that you read up on the two experiments shown on this site that did actually work: Julie’s mountain lion, made with Quickwall cement over paper mache clay, and Jackie’s Goddess, made with thin set tile mortar over paper mache clay. Love you, your work, tips, techniques, etc. Was wondering if you tried adding the waterproofing liquid right into you pm glue? Even if you used plaster gauze, you could try adding the waterproofing to the water used to put the gauze in, right? In theory it sounds like it may work. If someone has previously asked and you’ve replied, I apologize. My mind is racing a mile a minute trying to figure this one out. I have not tried that, Judy. It’s possible that it would work, but I’m not sure if the plaster gauze would harden in waterproofing liquid instead of water. If you experiment with this or any other waterproofing idea, please let us know what you find out! 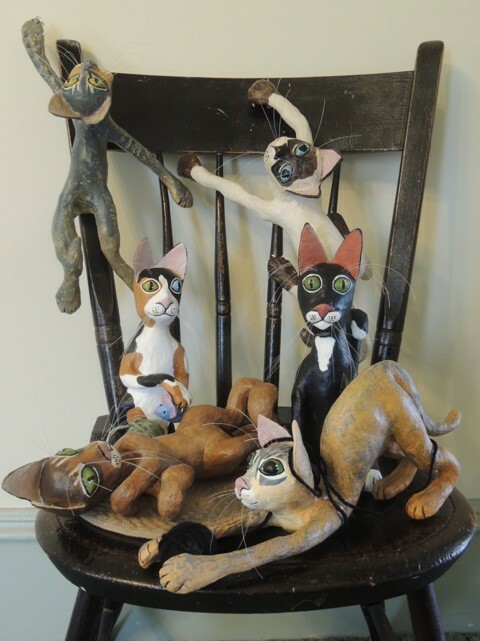 I came across this site http://www.dk43.com/pts/about.htm, a paper mache artist named Linda Pozzuoli Merica. I see by her gallery she has made paper pulp stone floors, bathroom vanity tops and outdoor things as well. She must be able to keep her paper pulp waterproof especially since she uses it in bathrooms. I wonder what her secret is? Thought you might like to check it out if you haven’t already. Hi Sonya. You’re right – Linda does some very interesting things with paper pulp, and it looks like she wrote a book about her process. I did a fast search inside the book on Amazon, and she does say the paper pulp is waterproof once it dries. I didn’t get to see how she manages to get that to work. I put the book on my wish list, but I don’t think I’ll buy it yet – I’ve splurged this month already on the computer program I’m using to make my papercraft models for paper mache trophy heads. Maybe I’ll order one next month. In the meantime, if you just happen to figure out her secret, please let us know! Forgive me if this has been mentioned before. Varnishes are never going to work. You need resin. Either epoxy or a UV resin that’s either put on in stages, or kept in the house until you expose it to sunlight. Making sure to cover everything in resin will make it waterproof. I love Ice Resin? Brush it on, using 3-4 coats (15hrs apart) to be sure it’s entirely covered. Be sure to prop the guy up on pegs or nails, to let the resin flow away from him. Thanks, Annie. I had never heard of ice resin, and I had to look it up. Is this what you were referring to? Is it safe to use in the house, with normal ventilation? I love the sculptures that you are creating! Many years ago I worked for a company that sold a range of water proofing products. I don’t have an answer for you but, I would like to make a few comments that might be helpful to you. Secondly, spar varnish has poor UV performance, it will yellow and breakdown quite quickly in sunlight because it is clear, as a water proofer it performs no better than any fully opaque oil based paint (poorly) Oil based coatings are resilient to water, but harden and become inflexible and brittle in a matter of months. Think of the coating as walking on a sheet of glass covering a soft mattress, the coating must always be more flexible than the substrate. and will only ever be as good as the substrate! The best suggestions I can make would be try to think of ways to improve the substrate! Try to to make the whole object more solid and water resistant from the inside out, You must assume that water is going to get in, regardless of what you do, because its water! and that’s what water does best! Then look at the building industry and all their plywood and acrylic membrane houses they insist on building everywhere, for inspiration. 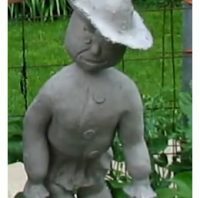 There must be a roll/trowel on coating that could be easily modified with a thickening agent (possibly Baby talc) into a reasonably workable clay? Try thinking, strong waterproof armature, Robust paper shell with good waterproof adhesive, coated in a tough, flexible acrylic clay made from one of those external membrane products and then possibly painted in a less waterproof but far more weatherproof, external acrylic house paint. Good luck with your beautiful works of art, the great out doors could only be made greater with their presence! Thanks, Martin. You’ve given us a lot to think about. Wow – that’s an impressive site! I read about the silica powder in the book I just received, Creating Concrete Art Furniture. The author uses it in the final cement slip that he uses to make a marble-smooth surface on his furniture. when I just tried to find silica powder on amazon.com, it showed me diatamatious earth, and I happen to have some. I wonder if mixing it with the metakaolin that I just bought, which is clay, would give the same result as his recipe? I’m going to read his site and see what he’s doing. Since I bought the acrylic fibers already, I’ll use them instead of paper, although I do like that idea of using paper for reinforcing. Hi Jonni, I am loving your experiments ! I have an idea for another one you might want to try. Have you ever looked at Papercrete on Google…it is a mixture of Portland cement, a rough newspaper mix and other soils. If a very fine mix of paper was used instead of the rough paper mix and some dry pottery clay was added…..would this be a product similar to Pal Tiya ? I watched their videos and they said and showed that their clay was very fibrous…which made me think it might contain paper. I was wondering if adding Portland cement and more pottery clay to your existing paper mache recipes might result in a cement clay suitable for direct sculpting…. in the world of pottery and ceramics, the artists have started using paper mache mixed into their ceramic clay for a lighter weight product that resists slumping and cracking during the drying process, and fires up great. 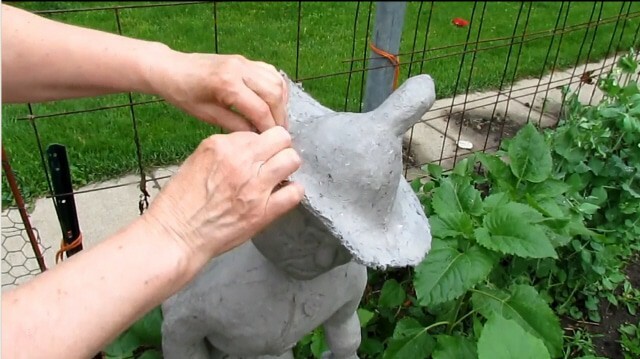 A person could mix the dry cement and dry clay together, mix with water and then add the fine paper mache mix….the key would be discovering the correct quantities of each to make a workable clay….just an idea that might work for your outdoor sculpture…. First of all, thank you so much for conducting this experiment for us! Mr. Scarecrow is so darn cute! I was wondering–could you let him dry out and the cover him with that fiberglass-reinforced concrete material? Or if not all of him, maybe just his hat? And please don’t beat yourself up about choosing to make him instead of a small square–I may be wrong, but I think if you had just made a small square to experiment with, the water would have run right off those flat surfaces, dried quickly, and remained hard. It would have appeared to be a successful approach. However, because Mr. Scarecrow’s hat shape and texture didn’t allow a fast runoff, we got to see a more realistic outcome. So while you maybe could have made a smaller scarecrow, I think your experiment was absolutely perfect! Well, shux! But you sure gave it your all. And still, for those dry outdoor days or even decorating for that special cook-out, this would be just fine. Regardless. I just love your scarecrow fella. Jonni check out Pal Tyia I think it’s right up your alley … It’s not in the US yet .. But check out the web site. It’s out door clay! Just what you want! Love the scarecrow .. Bring him INSIDE! Yes, I love that site! I’ve been watching for months to see if they were shipping to the US, but they aren’t so far. It’s smart for them to go slowly, but it’s hard to see something that works so beautifully, and not get to play with it. For those who wonder what we’re talking about, this is the Pal Tiya site. Be sure to check out the dragons. I’m sure it’s a form of concrete, with additives included to make it more clay-like. I’ve been doing some research and may have found a product that we can add to Portland cement to get that effect, and I’ll keep you all posted. Hi Michele. Your giraffe is wonderful! I think my experiment would have worked better if I used the sealer, then painted, then added several coats of spar varnish on top. But still – we’re working with paper outside, so it’s always going to be a gamble. I sure hope your giraffe survives, because it’s really nice. Love your website and inspiration. However, I’ve been collecting kitchen bottles and cardboard, bought five rolls of masking tape, and all the mache stuff for my brilliant piece, and company is coming. Where can I hide this trash? The tissue mache will go in the fridge, but frankly, I’m beginning to like empty plastic bottles way too much. Can you recomend a paper mache rehab center? Hi Sue. I say leave the stuff right out on the counter. In fact, collect more, and let your guests make something with you. Have a paper mache party! Why not? So sorry that the time and effort you put into that project didn’t work. We all appreciate your dedication to paper mach and I just want to thank you for your experiment. Don’t give up, just go smaller! I hope you hear from lots of people who have found a product and process that works. Have you ever heard of using boat varnish? Hi Cheryl. I know many people have good luck with marine varnish, but my one experiment with it failed miserably. It cracked in the sun. Rich mentioned today that he seals the paper mache with the marine varnish, then paints, then seals the paint with deck sealer. Three layers, essentially, between the paper mache and the weather. I may try that some day, but at this point I’m really wondering – if we have to go to so much trouble to protect the piece, why not use concrete instead. I need to do a survey of some kind – why do we want so bad to have paper mache work outside, when we already know that concrete works? For me, it’s that concrete doesn’t feel as good when I’m sculpting with it, and it’s heavy. Is that why most of us avoid it for outdoor sculptures? It could be that concrete doesn’t feel as good. I don’t really like concrete for much of anything. I don’t like it for patio stones, I prefer slate or some decorative stone for it’s natural beauty, and as far as a garden bench, wood with wrought iron suites me better. Maybe it’s the natural part that concrete doesn’t have. You can make paper mache look how ere you want! It also has a smooth texture to it and is light. Plus, we’re all on a site about the Ultimate in Paper mache, LOL. I do agree though that maybe our sculptures made of paper and clay are better left inside. Cheryl, you have good points. I’ll add them to my list of objections, and see if anyone out there has a way around them. And did you try to post an image? It didn’t come through for some reason. I have a blank square on the admin page that looks like a photo should be there, but isn’t. My site has been doing that lately. If you did try to post an image, please try again. Thanks, I was trying to add a picture of my cats, but I guess it didn’t come through. May have been something I did wrong, or the size maybe? Anyway, I’ll try again. It still didn’t work. 🙁 Would you do me a favor and email it to me, just so I can see if there’s something obvious about the image that’s stopping the upload plugin from working? If it’s something the plugin is doing, the developer might be able to fix it so it doesn’t happen so often. OK, it worked when I did it, so I’m still not sure what happened. One possibility: I changed the file name to “Cheryl” so it would be easy for me to find it on my desktop. It was originally named by your camera, I think, and it’s possible that another image with the same name had already been uploaded by someone else. Do you happen to remember what the error message said? And again – wonderful cats! Thank you Jonni for figuring that out. Also thanks for the compliment. I don’t remember what the error message said, it was 4 or 5 lines long. If it ever happens again I’ll copy and email that to you. It is better to brush on the clear sealer because the brushing action will force the sealer into small crevices. At least three coats are needed but five would be best. The biggest problem with external clear sealers is that they break down from the sun and need additional coats every year unless you use the $200.00 a gallon two or three part sealers. Although I’ve felt my waterproofing methods were relatively successful, I also had the condition where paper mache projects felt softer after a rain, though I found no degradation in the actual mache or paper clay afterwards. And once they dried they were just as rigid as before. Perhaps, though, it speaks to some future failure down the road as yet that hasn’t happened. I will say the paper clay cauldron I built two years ago has held up remarkably well without that “spongy” feel to it, and that could be because I slightly changed my method. Again, the cauldron was a traditional strip mache base over which I painted on a coat of spar varnish, then applied a layer of my paper clay recipe. I applied spar varnish to that as well, then a primer coat of paint, followed by several coats of latex paint (and the indoor kind to boot). It’s then painted with two coats of deck sealer, with a single coat applied each year thereafter. 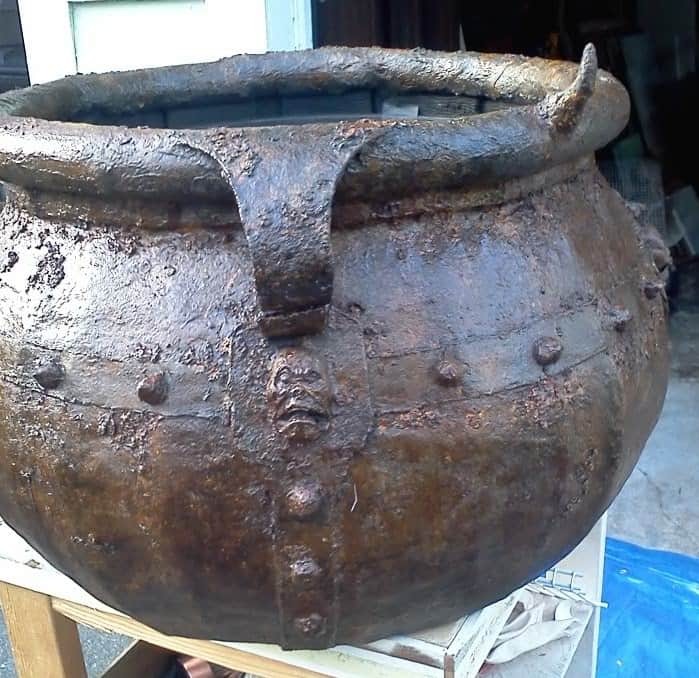 As you’ve explained previously, that’s my standard waterproofing technique now and though you didn’t seem to have as much success when you tried it, the cauldron remains as solid as it did when first completed. I also tend to use whatever waterproofing materials are on sale when I shop, though spar varnish is rarely cheap (it does go a long way though). I’ve also allowed tested the paper clay covered in spar varnish by allowing it to soak in a bucket of water, and it came out perfectly fine afterwards. Good luck with your future experiments. Hi Rich. I think you’re right about the pm clay hardening up again a few days after the rain. That’s happening now with Scarecrow. I assume there’s some softening of the pm clay down deep, perhaps where the sealer couldn’t get to it. Jonni I was thinking about 2 things, one is that stuff that they are painting on worn decks and concrete to restore them, I think that might help your. And also the second product made by Rustoleum that doesn’t get wet. I love your little scare crow. I hope you can save him. Get him inside or cover him with a big garbage bag. I hope you can figure it out. Hi Artis. It sounds like Rich has tried the deck sealer, and it worked well for him. That may be the way to go. I might try painting my Scarecrow after he gets dry, and then see if I can get a small container of the deck sealer to go over the paint. I was really expecting this project to be successful since I am thinking of starting some outdoor sculptures myself. I am new at paper mache (less than a year) and I must say that it was because I stumbled on your Youtube channel. I never knew that paper mache was so easy and interesting. I got your book on tiny dogs and I have become addicted. Have you considered adding some concrete sealer into the paper mache clay? Then maybe you can give it a coat when it is completely dry. Just a thought. Be encouraged. Your efforts are greatly appreciated. I have learnt so much from you and I look forward to new and exciting projects from you. Hi Pearl. The particular sealer I used can’t be added to anything that’s wet, so it wouldn’t work inside the wet pm clay. But some other additive might help, perhaps as a replacement for the glue. I’m starting to think that instead of trying to make paper mache act like concrete, it might be more reasonable to find a way to make concrete as easy to use as paper mache clay. Then we would have the best of both worlds. I’ve spent a ton of money on books (most of them still haven’t arrived), and I’ll keep everyone posted. This site is my inspiration for all of these experiments, and if I lived in New Zealand I would definitely order some of their product. It looks wonderful. Check out her dragons! Well, I’m sorry, but maybe only the hat will sag! I guess I need to stop “wondering” and do a little experiment myself – something simple! One other comment. Last October when I was making pumpkins, I got impatient and didn’t let the paper Mache totally dry before turning it upside down and applying paper Mache clay to the bottom. When I turned it out, there was a big dent where the stem had sunk into the sculpture. I thought, “what the heck,” and soaked the top with water. It soften up significantly, of course, and I was able to save it. (Don’t worry; it is still drying! Maybe I’ll get it painted this year.) It did take some sculpturing, however. As you well know, water is not its friend. Thanks so much for your work and sharing with us. I hope you’ll be surprised by the scarecrow and only it’s straw hat will sag! Are your books sold at barnes and nobles and other book stores? They aren’t usually stocked on the shelves, but many bookstores are willing to order one for you. Thanks for asking! Sorry to see that the scarecrow didn’t work. Maybe try a 12″x 12″ square of pmc and do the waterproofing. I know how you feel. I have a question about storing pmc. What is the best way to store the pmc so it will last the longer’s? I have put it in the fridge and that seems to help. And I try and keep all my tools clean. What is the longest time you have had or any one else have had the pmc last. I can’t use a full batch up very quick. I know that people have thrown their pmc in the freezer, with great success. You’d need to wrap it up really well so it doesn’t dry out, though.